While there are many Botanical Gardens in Italy (some claim that botanical gardens started in Italy) Bologna University’s Botanic Garden holds a special importance as one of the oldest in Europe. The garden was founded in 1568 as an important site to study the medicinal values of plants. More recently the garden went through a period of neglect but this has now been reversed and the garden enjoys a new period of growth and development. Areas within the gardens include: natural habitat reconstruction, medicinal plants, ponds with aquatic plants, a natural wood with very large specimens, and a marshland, a new area in development. This private garden is a culmination of centuries of care and design. Begun in the 7th century, the garden only really began to take on its present day shape from the 19th century. Visitors have come to these classic Italian gardens since the 18th century. The present owner has an excellent collection of herbs and a museum of agricultural equipment. Today it is a beautiful home that can be let by the public for private functions or for Bed & Breakfast. On a hill with views of the Golfo dei Poeti, both the micro and macro views here are worth seeing. Villa Marigola is representative of the rand Italian seaside houses. The garden originally contained citrus fruits, olives and grapes. When the landscaped garden came into fashion in the 19th century, the land around the house was changed into a more formal garden with paths and vistas. Today this venue can be booked for functions or conferences. These gardens are over a century old but have suffered some from neglect over the years. The present owners are carefully renovating the gardens to their former glory and the results are already beautiful. The gardens are located at the base of the Tolfa Mountains, on the site of an ancient Etruscan and Roman settlement. The estate dates to before 1500. Immaculate terraced lawns, groups of trees, giant Cedar of Lebanon, and many Etruscan tombs and Roman ruins turned pleasantly into natural rock gardens are a pleasant surprise. The special feature of these gardens is the rose collection—possibly the most important private rose collection in Italy. Also famous for its rose garden, this is an exceptional example of a private botanical garden. With approximately 7000 roses, (some were thought previously extinct), the garden holds an incredible history of the rose. The garden maintains a strictly organised structure–subdivisions of Section, Species, Sub-species, and hybrids (of very complex lineage). Each rose is labelled with its botanical name, the year of introduction to Europe, and if relevant, the hybridizer. Donations help maintain this site of significant horticultural importance. During the nineteenth century and well into the twentieth, the garden became overgrown and neglected but in the 1970s a program of restoration was implemented by the Bettini family, and today the garden, which remains private property, is a major tourist attraction. It is unfortunate that in recent years, a number of the stone sculptures have had fences put around them. Whilst this may deter visitors from climbing on them, it has the effect of making them more remote from their natural setting. The original gardens were created by Vicino Orsini, the Duke of Bomarzo, 1528 -1588. A devoted husband, he created them in memory of his wife, Julia Farnese after her death. He called the garden a Bosco Sacro, a Sacred Grove or Bosco dei Monstri, the Monsters’ grove. In this case Monster, from the Latin, monstrare, means to demonstrate. The gardens therefore, are meant to demonstrate his love for his wife. Although famous and visited by many well-known people, many years later the gardens became neglected and lost much of their glory. And yet, with the overgrown vegetation and the crumbling statues, the gardens took on an even more fantastic aura. 20th century restoration has brought back some of the glory if the garden’s past, but the necessity of fencing around the statues has meant the magical realism has been lost to some extent. Along with the Monster Grove at Bomarzo, the garden at Villa Lanta is one of the most famous Italian 16th century Mannerist gardens. With waterfalls and water steps, fountains and wet grottos, the water features are especially impressive at Villa Lanta. A hydraulics engineer, Tommaso Ghinucci created such successful water features that they still work today. The garden were badly damaged by allied bombs during WWII but has been under a careful and extensive reconstruction project and is now part of the Grandi Giardini Italiani, an organization of protected, exceptional gardens. When you say “some claim that botanical gardens started in Italy” does the ‘some’ refer to Italians? Interesting post – I love Italy and if Spain ever deports me perhaps that will be my next adventure. Hi Rob! ‘Some’ refers to ‘some people’, both Italian and many fans of Italian gardens. There is some debate among garden experts and fans alike! Yes, not sure which gardens I prefer–Spanish or Italian. Both are fortunate with growing conditions, traditions and history, and both have very distinct styles. 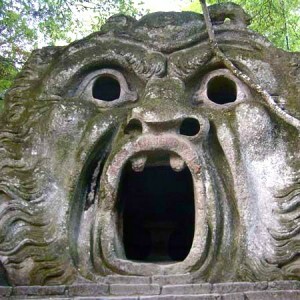 For the sake of accuracy, the gardens known as Sacro Bosco or Monsters’ Park are privately owned, cost 8 euro entrance and are near the town of Bomarzo and ORTE is the largest town and train station. Villa Lante is in BAGNAIA near VITERBO.